Update: Yoga for Skanda continues indoors! Yoga for Skanda continues Saturday, September 29 and Saturday, October 13 at The Synergy Center, Manlius! Thank you Chris DeAmicis for your beautiful generosity in providing these classes. Fee: $15 drop-in fee. Proceeds support the rescued and endangered animals of Skanda. Chris DeAmicis is a wonderful teacher! Please subscribe to her YouTube channel: Yoga and Meditation with Chris, visit her website: Gentle Yoga With Chris, and enjoy her classes at the Manlius YMCA, The Synergy Center, the East Area YMCA, and the Manlius Senior Center. Thank you Chris! ducks and chickens to help you relax, breathe, and feel the joy of the moment! 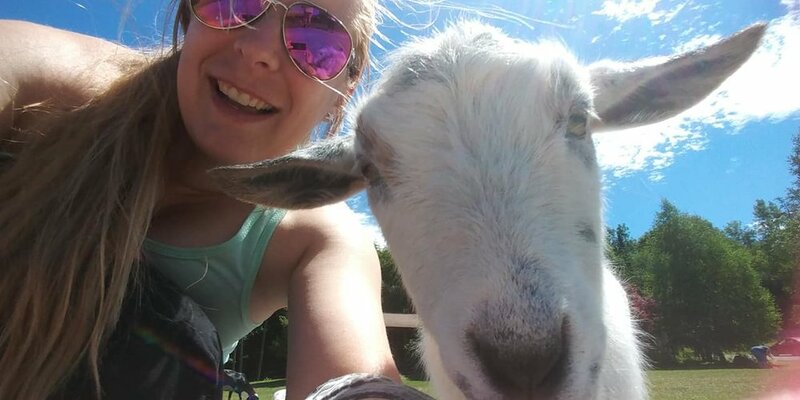 Please note: Goat Yoga outdoors is finished for the 2018 season, but will start again in the spring: something to look forward to!